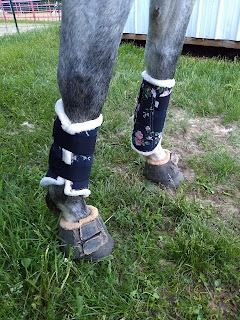 Confessions of a Dressage Barbie: Spring 2.0? 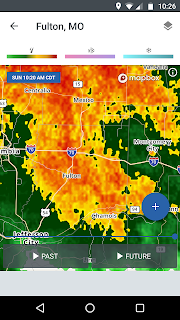 Apparently the secret to getting both some rain and a return to spring-like temperatures was just to complain about it, who knew? ;) I'm kidding. Kind of? Haha at any rate, no complaints about the weather now! Glorious, beautiful soaking rain this weekend. Just what we needed! Friday was Cinna's turn to work (I'm really digging the alternating days for the girls, it's nice! ), and I was pretty excited to try out a new bit for her. Wayyyy back when she first got started under saddle, she did the normal baby bit chomping. 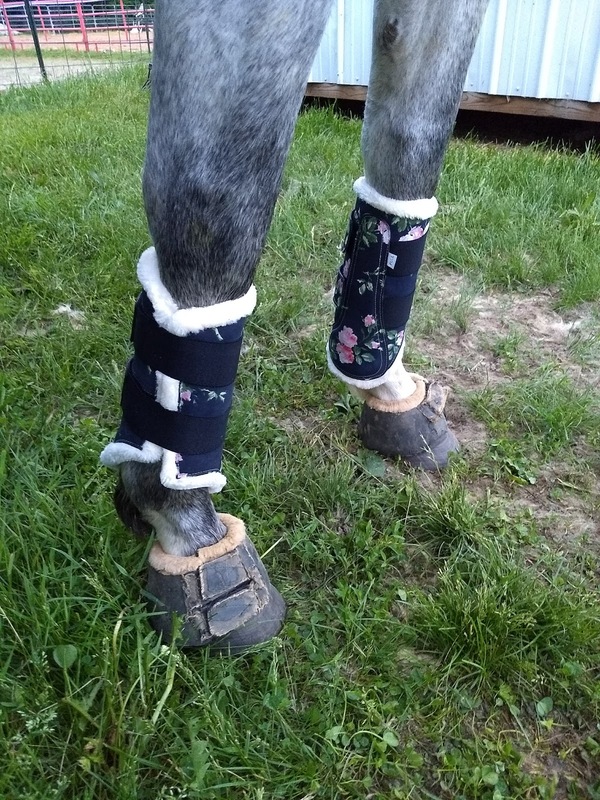 I assumed it would get better with time, and to an extent, it has, but she still is more active with the bit than I'm truly comfortable with. Over the winter, I was hoping it was just a sign her teeth were ready to be done, but I took care of that in March and the behavior hasn't changed much. 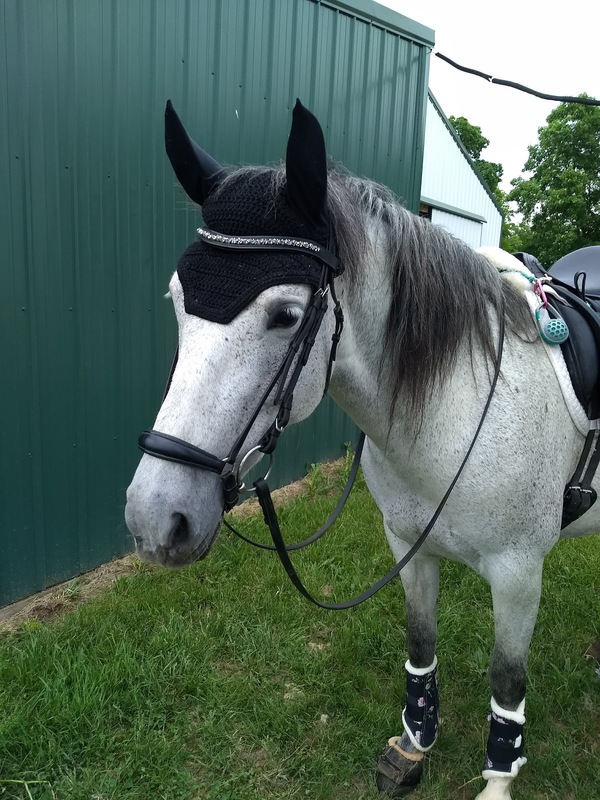 I've tried her in a wide variety of 3-piece snaffles (because I own approximately 13498743534 of them), but I finally decided to expand my search a little. After doing some reading and studying and discussing options with some friends, I finally decided to try her in a Mullen mouth. I had a Mullen mouth eggbutt happy mouth, but I loaned it to my mom, so I kept searching. I ended up with this -- loose ring, small port for some tongue relief, and it's the blue alloy (reminiscent of the Bombers bits, just without the price tag!). 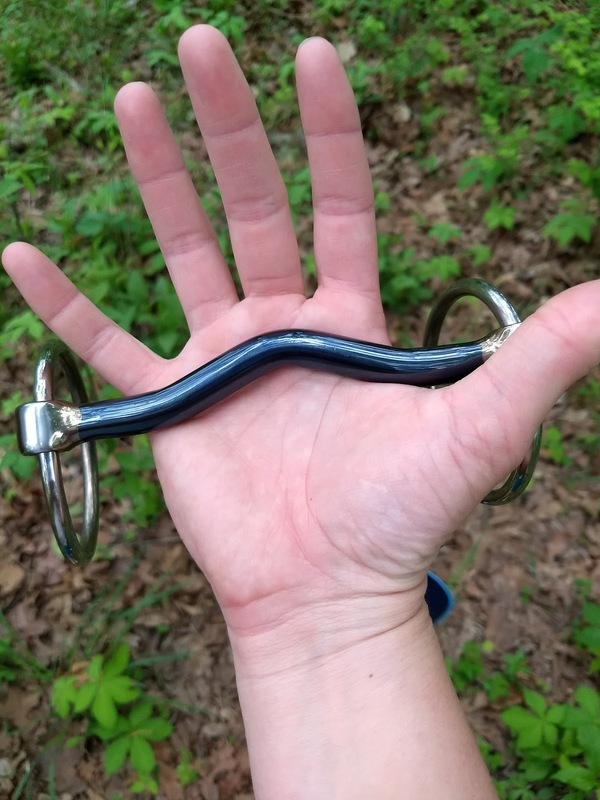 I swapped it out on one of her bridles when it arrived Thursday night, and then Friday morning I tossed her out on the lunge first to make sure she was acclimated to the new piece of metal in her mouth before I climbed aboard. She was perfectly quiet in the mouth on the line (although more than willing to canter, and less than willing to transition back down into the trot, haha), which I found encouraging! 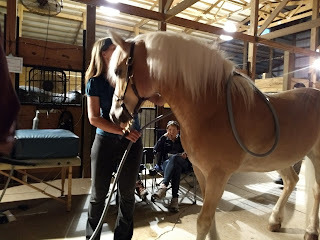 We ended up having a really good ride -- she listened well to the bit and seemed markedly more comfortable, although obviously it will take more than one ride to make a full judgement on it. Maiden voyage rocking these AMAZING floral boots from Stacie! She also murdered a bell boot in the last 5 minutes of the ride when I was letting her hack out in the yard. 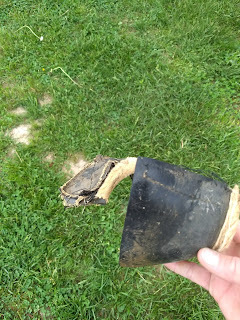 It was on it's last legs anyway, but RIP fluffy boot! I also had a SUPER busy weekend, so more to talk about there, but I think I'll save that for tomorrow! Did you have a pleasant, horse-filled weekend? Have you ever had any personal experience with PEMF? Ohhhhh bitting the young fussy mare. Story of my life! Glad you've found a promising bit though. The PEMF stuff is mildly intriguing to me, so definitely looking forward to you writing about your experience. Yeah it was a cool experience! And 😍😍 the boots. I love them. Yay! The boots looks so pretty on her! Badger actually hated a three piece bit too. I find that funny always since according to science they should love those. He's pretty happy in a single joint though. Haven't tried PEMF yet, but it's definitely interesting! Horses are exasperating! I still had a few single jointed snaffles from way back when I first got Jack, and I did try one of those too (since I already owned it) but she was about the same. We'll see if this Mullen mouth is a long term solution or not 🤷 I mean, you can never have too many bits, right? Haha. Thank god my horses are a generic 5" so I don't have to deal with finding off sizes! I have that same bit. Nilla loves it. Levi tolerates it. They always keep us on our toes! Interesting about the bit!! Will be interesting to see if she continues to enjoy it! The list of people stuff PEMF is good for was really long, I think I'll definitely try it again for myself as well! Such envy over the PEMF! Maybe you can find someone local who has it try it out! 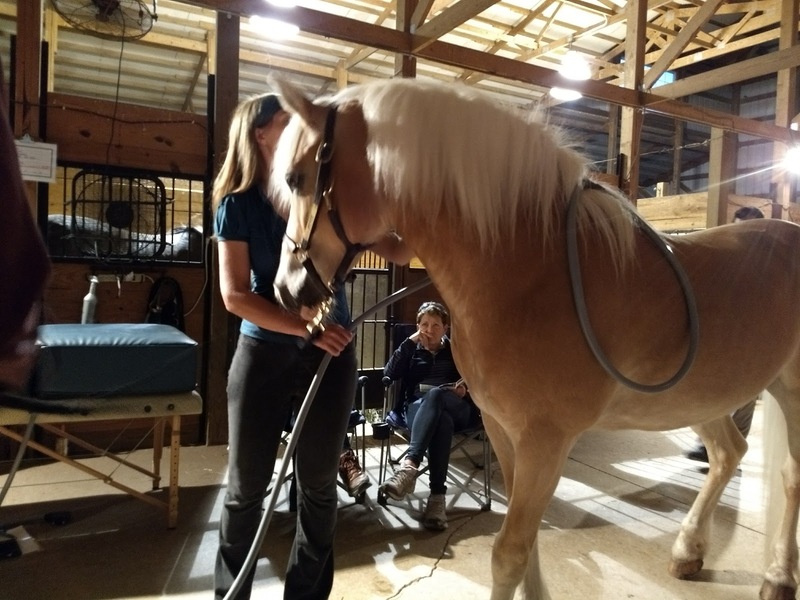 Haha yeahhhh I'm trying to see if any of the local folks will barter photos for sessions 😉 an equivibe sounds awesome too!